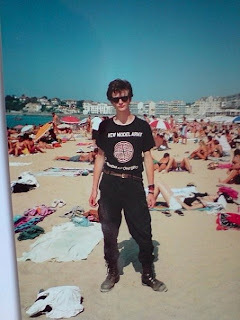 Congratulations to young Michael for representing NMA amongst the Gallic hoards of the Cap D'Antibes - Cromwell himself would have been proud of your insistence on wearing 18-hole boots and combats with Wayfarers - a rare cosmopolitan touch for a Goth. Young Michael looks alarmingly like Irish comic Ed Byrne, who clearly does his Vodafone commercials in full Goth clobber. Anyone wearing a New Model Army shirt is fine by me. Come together and celebrate, Goth! No stop it hurts I like it.